RMU – to infinity and beyond! The challenge I see with RMU as opposed to RM2 is the apparent lack of willingness to look beyond fantasy (and even then it’s their definition of fantasy). RM has always suffered (IMO) from the lack of a solid, accessible setting, and RMU just seems to accelerate that trend. They also took steps (especially in the combat system) to render it almost useless for non-magic settings if you leave it RAW. The flexibility that came with RM2 (and even RMSS in its own way) seems to be disappearing. In addition in a recent comment Hurin had noted the amount of HARP that seems to have found its way into RMU. There is nothing wrong with HARP but HARP is not Rolemaster and definitely not RM2! That got me thinking. Last year I bought HARP Fantasy and HARP SF. I bought them because I want to run a SF game soon and as I have said many times before I have lost my Spacemaster books. So HARP is certainly not locked into a fantasy setting and not into one single fantasy setting. Shadow World is statted out for HARP and HARP has its own core setting of Cyradon. HARP SF plays out in Tintamar but by default it also shares the same setting as Kulthea and Spacemaster because of the Shadow World connection. One of the things I like about HARP is that the last release was to truly unify the fantasy and sf rules and make them interchangeable. I only needed the fantasy rules as monsters make great aliens. There is a massive gulf between RM2 and HARP and I agree there is a lot of HARP in RMU. The skill system is the same, character creation is very similar. The move in RMU to less combat tables is almost a single step towards the HARP way of thinking and that I think is the problem with RMU. The only weakness as I see it with HARP, looking from a RM background point of view, is the combat system and the criticals in particular. The same old critical comes around again and again way too often and even in the same fight. The rest of the combat system works really nicely as far as I can tell. Another interesting thing is that the HARP forums are far busier than the RM forums if you exclude the BETA test forums. If you include them then you also need to include the HARP development forums as well. I see a far greater variety of voices in the HARP debates than in the RM ones these days. There is an active HARP community around the game and new HARP books are eagerly awaited,even if most of them are just re-releases to bring them in line with the unified Fantasy/SF rules. Whether HARP’s firearms are as good as intothatdarkness’s firearms is a completely different question but the fact remains that HARP does have viable settings and it does have modern day and SF elements that make it go well beyond the fantasy genre. I think RMU is trying to learn from HARP but is struggling to take the old guard with it to some extent. Which is a pity as we are the old guard. The move to a more simplified skill system and the move to generic weapon charts might not seem like a big deal if you play a lot of HARP/MERP. But I think it will seem like much more of a shock — and an unwelcome one — if you are or were a dedicated RM2 player. That’s why I think it is crucially important to offer options to allow grognards like myself to play RMU in a manner that is more familiar to us, and that’s why I created the individual skill cost chart/rules for RMU. If we are able eventually to get more specific weapon charts too, then I’ll be totally happy with RMU. The issue with simplified skill systems and combat systems is they tend to break when you leave fantasy settings. Driving is just one example. How do you deal with a character who wants to be a super-skilled motorcycle rider (for example) but only average in cars? Under the RMU model as it exists you can’t, because Driving is all one skill. And Knacks just don’t cut it in my view. Same for HARP. Combat is even worse, since the HARP-style system isn’t flexible enough to deal with new weapons in a meaningful way. I looked at the HARP SF stuff when dealing with modern combat and found the time scale was just too long and the weapon system too inflexible. You either have to detail every weapon possible (tons of charts) or overly simplify everything (which disappoints many players). That’s why I developed my firearms system the way I did. The sad thing, at least with RMU, is that many of these issues are easy fixes. If they don’t want to go down the individual skill costs road, just allow people to assign costs based on the existing Combat Training model. I proposed that, and never got a solid reason why it couldn’t be done. It doesn’t skew costs that much. and it gives players the ability to customize professions in a limited way. It’s also simple to understand, since you’re already doing it for one skill category. I think the simplified skill system is a problem even in fantasy settings. For the same reason you can’t have someone who is good with motorcycles but only average in cars, you can’t have someone who is good at Navigation but mediocre at Survival. This came up in a thread where we were trying to do an RMU version of the old Astrologer class, which should be great at Navigating by the stars, but shouldn’t have any special aptitude for survival. But it also comes up in other classes too. I agree with you too on knacks. I really don’t see the point; they are a complication that doesn’t add very much to the system, or at least not enough to justify a special rule and the added complication that goes with it. If first level characters are too weak, then give them more culture ranks, or a few extra ranks in any skills they choose. Now that culture ranks are in addition to normal ranks (i.e. culture ranks can allow characters to go over the cap of 2 times level skill ranks), you can just use the normal rank system and treat knacks essentially as personal culture ranks. You don’t need to invent a new rule just for this relatively minor benefit. As I never bought into the skill bloat of RM2 this is not a issue for me. The problem of the motorcycle/car driver simply doesn’t exist when you use meta skills. I am not going to try and convert you, meta skills is a play style that I like but I don’t think appeals to you. If a player came to me with the idea of the motorcycle rider with no experience of cars then that is simply a roleplaying choice. I don’t need a skill and ranks to enable the player to play the character they want to play. You’re right…I’m not a fan of meta skills. They lack the shading I prefer in my games. Skill bloat in RM2 came about, I think, mainly with the inclusion of Secondary Skills…many of which should have been primary. When I redid the skill system for my world we reshuffled quite a few of them, cut out many more, and had what I consider a manageable number of primary and secondary skills with more rational allocations. Remember, too, that much of the bloat came from the Companions, which were supposed to be optional but far too many seem to consider part of the core rules. Hurin, your example of the Astrologer also brings up a longstanding complaint I’ve had with the RM skill system (no matter which edition): why does a non-fighter profession always have a cheaper cost for leadership (which is usually defined in the rules as a skill commonly used in combat)? In RM2 I think it was the gambler that had the lowest cost and the highest level bonus for leadership. Anyhow, I digress…. In RM2, a Paladin did have 1/3, and a Leader (from Rolemaster Companion IV) did have a 1/2. I only remember though because I’ve played both, lol. Not sure what a gambler got for level bonuses though; a Paladin got +1/level and a Leader +2. I’m not sure anyone got +3. But I agree it does seem odd that a Fighter would be poor at Leadership; I guess after giving the Fighter +3/level at combat and Body Development, he already had enough. Sorry…it was level bonus I was thinking of. The Gambler had a +3 in Leadership because they grouped Leadership in Social. And I’d argue modern skills have to be much more specialized or at least specific. Piloting is one example, but there are many more. And I’m not crazy about simply adjusting DRs, either. That’s not, to me, very transparent to players and doesn’t help them evaluate what they can and can’t do with their characters. Old Top Secret had a pretty slick system, but most of its skills were knowledge-based (static maneuvers in RM terms). You had points in some, but the assumption was you had a score equal to half your Knowledge skill in all the rest. For me, it is more of a problem when the skill costs and bonuses don’t match the class name. A Ranger should be good in the Lore of Beasts; a Druid should be good at Survival but not so great Piloting mechanical contraptions. When you realize that a Ranger is arguably worse at the Lore of Beasts than a Mystic or Mentalist, and that a Druid would actually be better at driving a steam train than most other classes, you start to realize that the class names and their actual abilities don’t match very well anymore. How do your metaskills work, and do they eliminate that problem? It is always the case that something somewhere has to be down to the GM to interpret. You said ‘But I agree it does seem odd that a Fighter would be poor at Leadership’ but what is a Fighter? If you were playing a rank and file soldier that had just left the army in ancient Egypt then fighter is the profession that probably fits the game mechanics the best. If you wanted to play a legionnaire then that is a different character concept but still a fighter is the way to go. If you wanted to play a celtic warrior then that is still a fighter and so is a medieval knight. They are all very different characters but all the same profession. You could argue that if you only had the knight in mind then fighters should have strong leadership and so should the legionnaire but that doesn’t fit in with the celt or the egyptian. Celts are portrayed as free spirited and fighting as individuals and the egyptians are portrayed as being ruled by divine right, the rank and file were not paid the have opinions. So something as core as a fighter class is very open to the GM’s interpretation. With metaskills you have to put the characters as the centre of the game, not the rulebooks. There is one GM and in my case five players each with only one character. With metaskills you do not atomise broad skills into a potentially infinite number of specialisations. What you can do is use the difficulty modifications that we have as a core mechanic to reflect the characters background and experience. So in a fantasy setting imagine you have a young man who dreams of being a ranger and his twin brother who is drawn to magic. What does their education system look like? I would imagine that they may have one or maybe two tutors. Those tutors cover almost every subject under the sun from literacy to geometry to politics. Once they are done with their lessons they may split up and one goes out hunting with father and the other is more interested in some of the things the priests have to say? So they both received the same education in ‘Lore’. How much they paid attention in their lessons is down to how many ranks they buy but the actual material they were taught was the same. What they learned and retained is down to the personality of the two students. Say both students buy 2 ranks in Lore. During the game, you as GM know the characters, you know their back story, you know how they are being played. So when a question comes up and they both make a Lore skill roll you make the difficulty factor reflect their life experiences. Now, I imagine mystics actually being rather in tune with nature and the whole universe. That is what mysticism means to me so questions of Lore of Beasts may be viewed from different perspectives by the ranger and the mystic but I do not see the ranger as having any real claim to greater knowledge. In your world mystics may be very much more academic and that may not be true. That is your interpretation. Druids and steam trains, I would make driving beasts of burden slightly easier for the druid because of their connection to nature but the driving the steam train I would make harder as the vehicle is outside of the druids comfort zone. On the other if the player came to me and had this idea for a steam punk druid who wanted to promote steam. The wood is grown in harmony with nature and is a gift from the world. When it is burned it is not being destroyed but liberated and the CO2 becomes part of the lifecycle for new trees and plants. With that character I have no problem and would in no way make steam engines harder to drive. In a modern setting, I think SM called it Computer Technics which pretty much summed up what I did for a job for 20 years. I was one of those people who back in the Windows 95 to XP era could walk you through how to remove a virus from your PC over the phone from anywhere. I didn’t need to have a PC in front of me. I knew every option on every dialogue box. I used computers set to different languages with equal ease as I knew exactly what all the options were in order and the labels were irrelevant. I would tell you to tick the first and third checkbox and then press enter. You wouldn’t need to read the options to me. I think I had a pretty high Computer Technics skill. I speak German, not very well but I get by doing normal every day things. I switched on a friends computer and it was a Mac. When I had finished I could not shut the machine down. I just could not identify the option. My language skills let me down and I just could not interpret what I was seeing to guess which option was shut down. Likewise I am pretty competent with Android phones, I can take them to bits, replace screens and digitisers and put them together (and they work). I can install Android and experiment with different versions of android. On an iphone I have difficulty even getting bluetooth to connect. Does Spacemaster need different skills for Computer Technics for Windows and for Android and for IOS. How about for Windows XP, 7, 8 and 10? We then need a different skill for Ubuntu and Solaris. The driver who rides motorbikes but not cars under metaskills there only needs to be one driving skill. You as GM know the character rides bikes, the player knows they ride bikes so you just make car driving maneuvers more difficult because of their experience. On the other hand you could make things a step easier with Harley Davidsons so it is not just a bike vs car thing. You can have as many different subtleties as you and your players like in your game. What started me down this path was back in my RM2 days there was region lore. I quite liked region lore and in the first version of the skill it covered one geographical region. In one of the early companions (RoCo2?) it was changed so that region lore covered biomes. So you had region lore (wetlands), region lore (tundra) and so on. Where I live directly to the north are granite cliffs, sandy beaches and then the sea. That is ‘coastal’ as a biome. To my east I have woods, a great area of what are called Towans which are sparse grasses over a very sandy soil that move and shift rather like dunes. We can call that grasslands. To my south are granite hills and a river and on the other side of that is the English channel. To my west is rugged farmland and then the atlantic ocean. That is 5 biomes, coastal (sea), coastle (river), grasslands, hills and woods. Any ranger living near me would have to buy region lore 5 times. I think for a ranger is it is 1/2 so to have just 2 ranks is 15DPs just to know where he lives. With the original region lore that was just 3DPs for the same knowledge. If you have a limited DP economy whether it is fixed at 50DPs or the variable 30-40DP of RM2 at first level the more skills in the game the less capable the characters become. I use about 45 skills with an average cost of 2DPs for the first rank and a fixed 50DPs. So a starting character could in theory buy one rank in 25 skills out of the 45 or more than half or 1 rank in 55% of all skills. In RM2 there may be as many as 200 skills but the average cost for one rank is still 2DPs so a typical RM2 character would have maybe 36DPs at first level, buying 18 skill ranks out of 200 or one rank in just 9% of skills. To make matters worse some skills are just simply essential. You cannot go without body development and perception so the real budget of DPs is less than it looks because you have to buy at least one rank in BDev and perception just to function; but that is a digression! The only place metaskills breaks down is when a player who is playing a druid or a biker suddenly wants to jump on a giant quarrying machine and drive it, pointing to their character sheet and saying “I have +80 in driving so I am going to hand brake turn it and fling the doors open let the others jump in! What? -70 on that roll but I have 14 ranks in driving!” Rules lawyers and metaskills frequently clash because the rulebook says the skill covers x,y and z so I want to be able to do x, y and z.
OTOH, I think skills in modern settings should be much more highly specialized than a fantasy setting. This jumped out at me. Repeatedly I have seen you argue for skill costs based on your personal definition of a profession. Rangers should be good at this, Druids should be good at that etc. But what’s in a ” class name”? Why is your mental model or profession tropes more valid than someone else? Below Peter touched up this–why should a fighter have leadership skill? I don’t see any connection between the fighter profession and leadership. Maybe you then call a fighter with leadership skill an Officer? A Knight? A Warlord? Bam! I just created a new profession. That was easy. I’m not challenging your opinion–I just see things in reverse. A name should describe what something is, not what something should be. The Professions argument is the same argument for endless skills–you can create more and more niches, offshoots or “subclasses” for an endless stream of professions. How about a lawyer profession? But wait, what about lawyers that are very good at arguing in court–should we create a new profession called a Litigator. What about Lawyers that are experts in a certain field? Three more professions: Legal Consultant, Advocate & Solicitor. How about an assassin that uses spells? Nightblade. An assassin that uses martial arts? Ninja. A fighter that wears furs and carries an axe? Barbarian. It just never ends and there will always be someone who comes up with a slight spin on an established profession that then requires a new profession name, marginally adjusted skill costs and perhaps a slightly modified set of base lists. We don’t just end up with skill bloat, we have profession bloat. That’s why I use No Profession. My players can build a character to model almost any trope, any character or any concept without worrying about individual skill costs that become negligible after 10th lvl. Just my viewpoint–not trying to pick a fight! We all of course have different tolerances for specialization; some of us want more generalized classes (thus ‘Fighter’ could cover Knight, Bounty Hunter, and Samurai), whereas some of us would prefer to have specific classes for that. RM2 had more specialized classes, whereas RMU has made a change and gone more towards a more generalized class system. Neither is inherently better than the other. I’m not arguing that. What I am arguing is that, whatever system you choose, you need to make sure that the class does what players will expect it to do. It is certainly true that some skills and competencies are judgement calls, are reflections of an individual’s subjective image of the class, and aren’t implied in the class name. On the other hand, though, we can all agree I hope that there are some core competencies implied in the class description of a Ranger, and that players will not be happy if their ‘Ranger’ is not good in things they expected a Ranger to be good in when they chose the class. One expects a Ranger to be good at acquiring a knowledge of wild beasts; in fact, the class description of the Ranger uses the words ‘outdoors’ twice, ‘wilderness’ twice, and ‘nature’ once. So a player has a reasonable expectation that their Ranger should be good at understanding wild beasts. That expectation will not be met by the current RMU system, in which a ‘Ranger’ actually has a higher cost for Lore: Creatures than a Mentalist or even than No Profession. These are the instances where the class name no longer matches the class mechanics. It doesn’t even match the actual description of the class in the RMU rules themselves. Side note: Yes, the Ranger does get a professional bonus to Lore: Creatures. Whether that compensates for a higher skill cost is debatable, however. I’d personally much rather have a 1/2 skill cost than a 2/4 skill cost and a professional bonus– especially if I only have 3 points to spend on this skill per level. So I am definitely not saying that my view of the Ranger is the only valid one. There are many judgement calls and much room for interpretation when making a Ranger class. But let’s also admit that there are some core skills that a Ranger should be able to be good in — and better in than a Sorcerer or No Profession. That is in fact the very essence of the concept of a class/profession. A Ranger profession should be capable at outdoors/wilderness/nature skills, or else you shouldn’t be calling him a Ranger. That is just a recipe for player frustration, because players are going to choose to play a ‘Ranger’ specifically because they want a character that is good in outdoor skills; and one that is better in outdoor skills than ‘No Profession’. I was studiously avoiding mentioning ‘No Profession’ in my big comment. You have used the words ‘good in’, ‘good’, ‘better’ and ‘capable’ when describing the Ranger and Lore Creatures. It does not follow that the Ranger must be the best profession at Lore:Creatures. You could easily argue that the professional bonus will eventually make them the best at that skill unless your individual campaign emphasises that skill to the point where it is a priority to continually invest in it. Arguably the sorcerer profession is just as in tune with nature as the ranger, one is a channelling semi/arms and the other is a hybrid Channelling/Essence. Just because the sorcerer or any profession may have cheaper costs for that skill than the ranger does not make the ranger ‘bad at’, ‘bad’, ‘worse’ or ‘incapable’. What makes that distinction is how the player invests those last 3DPs. If they put those points into Lore:Creatures every level then the ranger will soon end up as the authority on creatures in the party. Anyone of any profession can learn any skill both in real life and in RM. It is not that difficult to argue that a Mentalist is both used to in depth study from a background in studying magic AND likely to be adept at understanding behaviour both in humans and less intelligent creatures as behaviour is the Mentalist realm. Skills are not the only thing that makes a ranger a ranger. They are semi spell users and their base spells and access to open channeling buts their knowledge far beyond the capabilities of the common folk. Beast Lore is a first level spell It reads 1. Beast Lore – Caster learns nature, value, and history of one animal. So whether one has the skill or not they can still have perfect knowledge and perfect recall. The ranger base list Survival’s Ways when paired with Nature’s Law gives the ranger everything one needs to be perfect ranger and in a way that no other profession can do it. Incidentally my concept of a ranger is nothing like yours. I see rangers as rugged warriors who live on the edges of civilisation. The emphasis is very much on the warrior element. I do see them as self sufficient and they certainly should have lore skills but the lore is not, in my mind, the defining characteristic. I would add, my own personal belief, that spells should rarely replace skills. The idea that a neophyte in lore could reach 10th lvl and access spells to have a in depth understanding of ANYTHING, basically breaks any world setting. And..this is no argument, but while I might agree with Hurins “conceptions” of a Professions skill expertise, this in no way supports those suppositions. Again, under “no profession” there is no need to define a PC to a social, cultural or gender specific meme. Many of the semi base lists are built around providing skill like effects but that go beyond what the skill alone could provide. This is true in RM2, RMC and RMU. And I think that is fine in a no-profession system. Please don’t interpret my comments as bashing no-profession systems. I’ve personally not played them much, but I have no animus against them. My point is just that Rolemaster used to define classes by skill costs and professional bonuses, which varied according to class, and overall fit the class descriptions and the general accepted usage of the class names in the RPG world. RMU’s move to reduce the variation in skill costs however erodes many of those class distinctions. In some cases, the skill costs are now the reverse of what they once were: Rangers now have a higher cost for Fauna/Beast Lore than Sorcerers, for example. Is that ideal? I really don’t think so. I think that once players really start to play the system and realize some of these changes, they will not have a favourable opinion of them. They will expect Rangers to be like the were in RM2: better at Fauna/Beast Lore than a Sorcerer. So basically I am just saying you can’t have your cake and eat it too. If you want to go to a full no-profession system, then that is great: all characters will have the same costs for skills, and characters will be defined solely by what skills they choose to buy. But if you go to a full no-profession system, then you have to accept that there are no professions. You can make a Ranger character by buying a lot of Ranger-type skills; but you don’t have a Ranger profession, because all professions have the same costs. That is of course implied in the very name ‘no-profession’ system. Sorry, I think my last post was unclear. I didn’t mean to imply that I thought Brian’s comments about spells not replacing skills were only valid for No-Profession systems. I’m a bit on the fence in regards to the question of whether spells should replace skills. I think ideally, I would like to see classes have low costs in skills that are at their core competencies, and then they wouldn’t need spells to replace skills. But of course in the present RMU system, many classes — and not just spell users — have skill costs that don’t match their descriptions. So while spells that replace skills might help semi and pure spell users have all the competencies they used to have in RM2, the spell solution won’t help pure arms users or characters who won’t or can’t find the development points to buy the spells. So overall, I think the better solution would be to have individual skill costs that match the class names and descriptions, rather than having spells patch the problem. I think if the Professional bonuses were more substantial then they would make a lot of the problems go away because professions as RMU has them would default to being strong in the fields highlighted in the class descriptions. I beleive RMU simply is not going to change its skill system now, this late in the development. Changing the professional bonuses though is a minor tweak by comparison. I like the way metaskills can be used to make characters generally more competent, because I agree that an over proliferation of skills makes characters fundamentally weaker. I think I’m still more in agreement with IntoThatDarkness though on the skill issue overall. First, one point about fighters, and here please excuse me that I’m wearing my historian hat. Even Egyptian and Celtic fighters could be capable leaders. Not every soldier is, of course, but the central point (and the foundation of the reason why fighters’ costs should be relatively cheap) is that the military environment was conducive to learning leadership. For the Celts at least, war was a way of improving your social status and moving up in the world, and many of their greater leaders were chosen by merit. Being around lots of other people, and even more so being put in charge of them, provides some wonderful opportunities for developing those sorts of skills. Not every fighter will be good at them– in game mechanics terms, some will have poor stats for the skill, others won’t bother to invest the development points, others won’t ever get to very high level and so won’t even have the points to begin with — but the point I think is that the lifestyle of the fighter is well suited to leadership. So I think the costs for a fighter should not be very high. Similarly, you certainly could allow your Druid to become a steam train engineer. The problem I see with allowing that is that Druid’s player now knows that if he wants to do anything, all he has to do is come up with a neat explanation. He can pilot a jet aircraft if only he argues that the jet fuel is not burned but is fossilized creatures being liberated and absorbed back into the primal ether. He can become a computer wizard if he only says that the electrical charges in computers are almost sentient beings and so he has a natural affinity for them. In the end, the balance of the game is upset if a class that by its very nature isn’t supposed to be good at mechanical things now suddenly is, even though he has spent less development points on the skill than a character of a class that is supposed to be good at the skill and has spent the development points. If a player wants to play a steampunk engineer, I’d prefer him to play a Delver, or an Arms Tech from Spacemaster. If I allow him to be a techno-Druid (even though that does sound kind of cool, I admit, and might be a fun class), then I’m allowing him to be competent in more things than other classes are. He is competent in all the Druid and Nature skills, plus he also now is competent in a whole range of technical and mechanical skills. So why play an Arms Tech when you can just play a Druid and get all the benefits of both classes? I think another analogy is digital vs analogue. When Windows used to start in safe mode you used to get just 8bit colour and you could see clear delineation between each colour. 8bit colour allowed for 256 colours. 16bit colour allowed for sixty five thousand colours and 24bit colour allowed twenty four million colours and was considered ‘photo realistic’. These days we typically have 32bit colour and there is no drive to improve as the human eye cannot distinguish the graduations beyond that. Going back to 8bit colour there were 8 basic colours and 8 shades of each colour. Everything was explicitly exactly one value or another. That is RM2. Instead of 256 colours it has about 256 skills and you roll this skill or that skill. Analogue doesn’t have discrete values like that. If you look at the sky (think Windows 95 loading screen!) you do not see the edges where one shade of blue ends and another starts. What you get is a continuum of shades. Metaskills are like that. X skill can be applied with a modifier that fits the setting, situation and the character and the challenge. First, one point about fighters, and here please excuse me that I’m wearing my historian hat. Even Egyptian and Celtic fighters could be capable leaders. One of the problems is that if when you sit down to create that character if you wanted a soldier turned leader than you pick the Leader or Knight or whatever profession fits best for that backstory. In that case you get cheap leadership but to balance the profession you lose somewhere else. You could argue that fighters should have lower costs for poetry and point to Edward Thomas, Isaac Rosenberg, Wilfred Owen, and Charles Sorley as justifying that argument. You have a good point Peter that the Ranger’s spells, and specifically the Beast Lore one, can be used to give them knowledge of wild animals. So in this case, the Ranger can use that spell to become good in a skill that I would say a Ranger should be good in. However, there are still many problems remaining. First is that any other Channeling user can do the same, or better, for a lower cost. A Cleric can do it at the cost of 1/2, which is far cheaper than the 3/4 the Ranger has to pay. The Beast Lore spell also has a 10’ range and a cost in power points… so if the ‘Ranger’ is out of spell points or can’t get within 10’ of the creature, he can’t figure out what it is. I think it is going to be disappointing to a player who chose a Ranger for his wilderness skills to learn that he can’t recognize an eagle from 15’ away. Secondly, I am arguing not that Rangers should have an affinity for all lores, but only for lores that are within the core competency of their class. I don’t see any reason for a Ranger to have an affinity for picking out different types of synthetic fabric or arcane languages, so they should not have a lower cost in materials or language lore. But Rangers should be good at wild creature lore. I don’t see any contradiction between the definition of Ranger that you just outlined – ‘rugged warriors who live on the edges of civilization’ – and what I just outlined. They are both outdoors-oriented warriors, well acquainted with wild creatures. That is in the very definition of the class. I disagree with your statement that “Just because the sorcerer or any profession may have cheaper costs for that skill than the ranger does not make the ranger ‘bad at’, ‘bad’, ‘worse’ or ‘incapable’. What makes that distinction is how the player invests those last 3DPs.” Let’s not confuse character with profession. An individual Fighter character might be better or worse than an individual Sorcerer character at Blades, depending on how they spent their DPs. But the Fighter class has been and always must be better than the Sorcerer class at a fighting skill like blades. The primary way Rolemaster has always measured proficiency is through skill costs. The Fighter is better at fighting because he has a lower cost. He finds it easier to use a Blade than a Sorcerer. A Fighter is better than a Sorcerer at Blades because a Fighter gets a greater return for any investment he makes in the skill. Side note: Level bonuses can also help, but we no longer have them in RMU, so in terms of the numbers, the professional bonuses pale in comparison to the value of skill ranks, at least at lower and mid-levels (the first ten ranks giving +5 bonuses, whereas the profesional bonus only gives +1). So the primary way of determining which class is better at a skill is by the skill cost. And in any case, the Fighter gets both a professional bonus and a lower cost in Blades. So yes, the Fighter class is better than the Sorcerer class at Blades. He can spend less DPs to get equal skill, or equal or less DPs to get greater skill. This is what I mean by ‘better’. Now in RMU, however, you have a case where a Ranger can no longer spend less DPs to get equal skill, nor can he spend equal or less DPs to get greater skill. The Ranger can still get greater skill in the end, but only at a much higher DP cost. The Ranger used to get Fauna lore at 1/4 and the Sorcerer used to get it at 2/6, but now the Sorcerer’ cost is cheaper. The Ranger has gone from being strictly better than a Sorcerer in Fauna/Beast lore to arguably worse. Even if you were ok with all of this, none of it saves the other classes that have skill costs that don’t match their class descriptions. Why does an Illusionist and even No Profession have lower costs for Religion than a Monk? Why does a Labourer have a lower cost for Poison Mastery than either a Thief or a Rogue? One can rationalize anything. If one wants to interpret a Druid as having a natural affinity for flying jet aircraft, I’m sure someone can come up with a reason for it. But think of your players. Are they going to be able not only to follow that logic, but anticipate it when they are making their characters? Are your players going to say, “I want to play a character who is a good jet pilot, so naturally I’ll make a Druid’? Or ‘I want to play a character that is a master of poisoned weapons. Obviously, I’ll play a Labourer rather than a Thief or Rogue’? The further one allows the mechanics of the professions to diverge from the commonly accepted meanings of their names –and indeed from the very descriptions of the classes in Character Law—the harder one makes the game on the players, and the less intuitve the rules become. You know programming, so I know you appreciate the value of an intuitive interface. When Druids are great at piloting jet aircraft, Labourers are masters of poisoned weapons, Clerics are bad at Religion, and Rangers can’t identify eagles unless the get within 10’ of then, then you have an unintuitive system. And one that is very different from the ones we’ve played in the past. I actually agree with almost everything you say. Where we diverge is I am also a proponent of No Profession as I see these as inherent problems with professions. I will give you one real life example and why I went to No Profession and why I think No Profession is mis-labelled. I was a player in a have run by Warl from the forums. It was a SpaceMaster game. I was playing the ships medic. I created my character and listed the skills I wanted. Totalling up the costs it soon became obvious that the list of skills I wanted were cheaper for the Armsman than they were for the Medic profession. The answer is no, it isn’t. The problem lay in the fact that I created the character I wanted to play, in effect I created the hero of a Sci Fi story who happened to be the ships medic at the start of the story. No Profession should not be called that. It should be called “Player Character” or simply “Hero”. In the same way that there are scores of Conan books and Conan has a different profession in every title so PCs careers can wander up and down the social hierarchy and their professions change. RM professions nail a character down to a single path or set of skill point costs for life regardless of that is thrown at them. And that’s why I allow profession changes. They aren’t that hard, really. The whole “profession as life way” argument is flawed as far as I’m concerned. I totally agree. This is another problem that just goes away under the ‘No Profession’ regime, you don’t even have to house rule allowing it and how much time and effort is required to affect the change. But you still have to deal with skill costs. To me profession equals access to training. When you change profession you’re gaining access or employer support for training, meaning the costs change. How does No Profession deal with that? You’re still working with fixed skill costs, unless you have some system for changing them. That’s where NP breaks down for me. You make some very good arguments for the No Profession or ‘Player Character’ system, and personally, I’d love to give that a try someday, especially as a player. My own players though seem to want a bit more guidance, at least as they initially learn the RMU system. Some of them are from DnD and are still learning RM, and aren’t sure what skills to buy. One good thing about a profession system is that it does give a template and easy guidance as to what skills to pick for your character. In RM2, they could just say, ‘I want to play a Ranger. Does Rolemaster have that class?” And I could answer, ‘Yes’, and they could take a profession whose costs would match the class description. Now in RMU, though, when they say ‘Does Rolemaster have a Ranger class?”, I can say yes… but to be fair, I also now have to give some caveats. ‘Yes, but, his costs for Beast lore and Wood crafting are higher than they were in previous editions, because of the category skill cost system. So if you’re looking to play a character that is very good in Beast Lore and Wood Crafting, you’re actually probably better off playing a Labourer or No Profession.’ That’s the point where their eyes glaze over, and they look longingly in the direction of the Dungeons and Dragons Player Handbook, because in that book, a Ranger is a Ranger. And this is why I’m going to keep developing my assignable skill cost model along the lines of what they already use for Combat Training. Why not extend that to other Categories? Like I’ve said before, I have yet to hear a solid answer from the devs about that one, and it’s both easy to do and allows players to in essence customize their characters within the existing parameters of the rules. With profession bonuses, we went to a system of allocating a set number of points (30) to players when they went up a level. They could allocate them to any skill they improved or gained that level, but with a maximum of +3. That way someone didn’t learn a new skill at level 10 and automatically get a +30 based on their profession alone. I’ve never been a fan of no profession, and especially dislike the concept for non-fantasy gaming. That is interesting about the non-fantasy gaming and No Profession. I have found that that is where it works the best. Here in the UK at least changes in profession are so easy, retraining is available and actively encouraged. I initially trained as a food technologist and worked in the industry for 8 years. I then retrained as a tutor for adults basic skills and did that for 10 years. I then moved into IT and ended up as an IT Manager doing that for 9 years. I then retrained in accountancy and work in financial services. That’s the eternal question, isn’t it? A Profession system and a No Profession system would answer it different ways. A No Profession system would probably say you switched classes multiple times. A Profession system would probably say your basic aptitudes never changed, you just spend your development points in different areas. The two types of systems both would have their strengths and weaknesses. The proponent of a profession system would ask if your basic aptitudes ever really changed even when you acquired new skills. Does a person who is inherently bad at math but who is given a job as an accountant actually become inherently good at math, or just develop skill in math that eventually overshadows his/her natural lack of aptitude in it? I totally agree but couldn’t answer those sorts of questions about a character either until I have played him for a couple of years. 1. In less advanced societies, career (profession) do not have the luxury of choice or self-determination. People follow in their families trade, are limited by economic circumstance or social constraints no matter what their true talents, aptitudes or proclivities. That’s even true today. 2. You can still assign stats in a way that are diametrically opposed to the optimal skill path of the profession. (ignoring RM’s minimum 90s). It’s a better argument to say that Stats drive a person’s aptitudes and ability to learn. A person with natural physical abilities: strength, coordination etc will learn physical skills easier and be better at it–no matter what they choose for a Profession. No surprise that I am in agreement. It is worth noting that RM plays down the significance of stats in the game. Hurin is a prime example of that where his players do not even roll stats any more. To put them at the centre of the character profession concept is totally alien to RM. For the record, we do roll stat bonuses; we just don’t roll stats, since essentially the only reason for rolling stats is to generate stat bonuses. So our characters do roll for something that determines natural ability; it is just that we skip the stats and roll directly for the stat bonuses. I agree with what you say though about RM playing down the roll of stats. I very much like your idea of using the stat directly for the skill bonus, and if I were redesigning RM, that is what I would suggest. We would in that case be rolling for stats rather than stat bonuses. True, but I don’t see that as a problem for a Profession system. Joe peasant has to farm for a living because his father was a farmer and law dictates that he farm his father’s farm. Joe’s own profession might be anything: he might even be an Archmage, profession wise. He spends his skill points in things like Animal Handling and Trading, at a relatively high cost, because this is what society demands of him; but if he were allowed to go to Hogwarts, he would excel in the magical arts. I don’t see any problem there. Joe has a natural aptitude for being an Archmage, but is working as a farmer. Remember that in a profession system like Rolemaster’s, profession is just aptitude. It doesn’t literally mean what occupation you have. A Fighter might be hired as a town guard, but he might also be forced into being a merchant or a cleric. All the profession indicates is the things he’s naturally good at, not literally what job he’s doing at the time. That’s a more serious concern, but I’m still not sure it’s a fatal one. In many RPG systems, you can have characters with poor stats. In DnD, you could have a Fighter with 3 Strength and 3 Constitution. RM2 addressed this with Prime Requisites, but I’m thinking (correct me if I am wrong) that this was primarily or only for player characters, to make sure they weren’t gimped. If you dictate that all Fighters in your world must have 90 or more in Strength, then you’re essentially saying that very few characters can be Fighters, and that there are no alternative Fighter builds (an archer for example) with low strength. Stats and skill costs then to me seem to be rather different. Skill cost dictates how quickly you learn something, whereas the stat indicates natural ability. I might be terrible at JuJitsu to start, but be a quick learner who acquires skill very fast. Alternatively, I might have natural ability but be lazy and progress very slowly. I don’t see much of a problem with that. There might even be problems if you don’t have that. That is to say, if you don’t separate natural ability from ease of learning and experience, you might have difficulties distinguishing someone who has natural ability in something from someone who is good in it only because she has worked hard to make up for a lack of innate talent. Ok, so the Profession is really a placeholder for the characters learning aptitudes? Isn’t learning ability really a function of some other sets of stats? While Constitution and Agility may impact physical skills, shouldn’t Memory & Reasoning may impact the vary act of learning any teachable skill? But isn’t learning really a function of systems, cultural transmission, heuristics and knowledge base? In both fantasy worlds and the real world knowledge is transmitted through forms–the better those channels the better the learning. In present day this is often measured by quality of education (Harvard Law vs. Maldives School of Very Good Barristering), the technological level of the society and institutional knowledge or an organization. While it’s probably too cumbersome for a table top game system, it probably makes the most sense to assign skill development costs to the source. For instance, learning “Law” in Eidolon might cost 2/4 while learning “Law” in the Mur Fostisyr might cost 4/10. Learning martial arts in Rhahkaan might be 2/5 while learning it at the Changramai monastarey might be 1/2–because certain institution and groups have better developed or advanced methods for teaching “more/quicker”. This also ties in learning, skills and knowledge to societies–which is how it works in real life. Plus it divests the notion of professional uniformity despite the cultural implications. Just food for thought–I’m not really offering up any rule suggestions. You mean, kind of like if Rolemaster designated Memory and Reasoning as ‘Development Stats’ and gave characters with higher Memory and Reasoning more development points? Now that is a whole new can of worms! I personally feel that fixed DPs make the game more fun. If you wanted to play a absent minded magician you would under RM2 naturally put a low stat in ME but then be penalised level after level by reduced DPs. We all know that stat based DPs encourage people to put the highest stats above then line. Ok, so my reply was a bit facetious, and I did want to note that there is some precedent in RM for having schools that enabled characters to learn skills more quickly. Check out p. 4 of the Shadow World module ‘Journey to the Magic Isle’ for how they try to handle it. They actually allow characters to gain levels by studying at the school, but tie the skills they learn to the type of studies and the specific development stat associated with those skills. Simple in my system. You’re currently an Accountant of some level, but with all your prior experiences intact in terms of skill bonuses and the like. You’re also on your fourth Profession change. I’d also postulate that your skill costs changed with each change in vocation (as retraining was made available and continuing education provided and as your older skills concurrently were reduced in priority). How would NP reflect those changes? In NP I just chose to spend my DPs on different skills. There was no moment of change from one to another profession. What I actually did was spend three years training as an accounting technician in the evenings whilst still working in education. I then spent another year once qualified trying to get my first job in accounting. So the transition was more one of evolution rather than revolution. That doesn’t seem all that different from saying what the Profession system is saying: that you were always an accountant (or food technologist for that matter), and that you just spent your DPs on different skills at different times in your life. The only thing the Profession system is doing differently is saying that in addition to individualized stats, people also have natural and individualized aptitudes for learning some things more easily, and some things with more difficulty. When someone finds weapon skills easy to acquire, we call that person a ‘Fighter’. Someone who picks up instruments easily but isn’t quite as good at animal handling we might call a Bard. This is the one thing I think a No Profession system doesn’t handle very well. It doesn’t capture very well the differences people have in ability to learn different subjects. I’ve always found skill in reading and critical thinking easier to acquire than skill in math or carpentry. I can certainly work to acquire more proficiency in carpentry or math, but it is harder work for me and takes more time and effort than reading or critical thinking. I’m naturally a Scholar, not a Labourer or Astronomer. So I think IntoThatDarkness’s question really is an important one: how are those differences in aptitude– not just in innate ability (stats), but in ease of acquiring skill– represented in a No Profession system? I’m not saying a Profession system is the only way to go, mind you; I’m just giving its rationale, explaining how I think it answers these questions, and musing on what the strengths and weaknesses of that type of explanation are. Are we really all just tabulae rasae (blank slates), with no individualized aptitudes? Or do we have inherent differences in ability to learn? And not just to learn in general, but to learn specific skills? I’m not sure stats alone capture those differences. If you are equating profession to aptitude then one could argue that you only need two professions. A left brain and a right brain dominant one. I think those aptitudes can be reflected using the professional bonuses system. Someone with no aptitude get a +5/rank, someone with natural ability gets +6 or +7 depending on how the player chooses to assign their professional bonuses. That even allows a level shading depending on how the professional bonuses are assigned. But do the skill costs change? That’s the real question for me. If they don’t, you’re really talking mono profession and that’s not a solid option for me. It doesn’t deal with enough training realities in many gaming genres (military, espionage, and so on). And given the way I do profession changes, what you did mirrors the concept in many ways. When you change profession, your level resets to one (your initial training period) and you only start earning full DPs again when you reach your prior level (mirrored by when you transitioned to accounting…your skills were at the same level as they were in your previous Profession). There is absolutely no way either a standardised NP or a spectrum of professions system is ever going to match a system that you have hand crafted to fit your groups ideal playing style. Any system designed for use by the bulk of players will never meet all the individual needs of every player. The costs do remain fixed but I don’t see this as a problem. The more one looks at this the less tidy the profession system looks. What about the mild mannered janitor by day who becomes a superhero by night? The academic by day but avid game designer at the weekends? Where do their natural aptitudes sit? Do they change profession twice a week? No profession does not have to be a fit and forget solution. I would suggest tweaking the costs to fit your setting. That isn’t my idea the No Profession in RMC has different skill costs to the No Profession in Spacemaster. There is no point in giving a low cost to a game set on Moon Base Alpha because they simply do not have horses. You like your layers that build up a character and I am the same. I think culture ranks are really important in building in that cultural influence. This is the ‘nurture’ element. I allow players to reassign their professional bonuses to reflect their characters aptitudes and strengths. This is the ‘nature’ element. Having just the one profession I then find in practice increases player choice because there are artificial barriers to taking the skills you want. Just one side note: there is nothing inherent in a profession system that allows or disallows profession changes. You can have a profession system that allows profession changes (e.g. DnD) or a profession system that doesn’t allow them (RM2). Only the fact that the RAW does not allow profession changes but does have facilities for the system neutral NP. I can’t say I agree. Fixed costs with no option to change them really doesn’t increase player choice. It imposes the same limits on all of them. I get that it works for you and your group, and that’s great. But for me it’s like the difference between Oblivion and Skyrim in terms of characters. The only real difference between characters in Skyrim comes down to racial abilities or lack thereof. Oblivion had some additional shading which made advancing interesting. Note, though, I’m not a fan of rigid Profession systems. Dragon Age is annoying because if you want to open locks from the beginning you HAVE to play a Rogue. What you do not get with fixed DPs is a character hobbled by poor rolls in the early levels. They will then never catch up with a different character with better stats and more DPs. The better endowed character has more DPs so can buy more skills so has more options and under most regimes can earn more exp. This can lead to an even greater disparity in the DP economy as levels come around faster. Differences in rolls can certainly wreck any game. However, there are ways of levelling the playing field even without fixed DPs. Point buy systems are perhaps the most popular and viable option. Currently, in my version of RMU, I have been playing with a different method. I have players roll stat bonuses, then add them up, and then characters who rolled less than the highest roll get additional DPs in proportion to how much lower they rolled. If the winner had a net +20 to stats and the second place person had a net +10, then the second place person gets 10 extra development points. This helps to even things up a bit. I am currently using it with fixed DPs, but you could also use it if you didn’t have fixed DPs. Of course you can house rule anything. I am a fan of point buy systems and that is what I use. In my published house rules there are no dice rolls of any sort during character creation. The professional bonuses can be a way to alleviate some of the problems, though they come with their own issues too. I think the main issue with them in RM2 was that they became too large for some people’s tastes at higher levels, especially since you didn’t have to buy ranks in a skill to get them. By level 20 or 30, they could overshadow even the skill rank bonuses, and they only got larger from there. So a level 50 fighter had +150 to all weapons skills, including say flail, even if he had never picked up a weapon remotely like a flail in his life. The second he picked it up, that level 50 Fighter would thus be better with a Flail than say a level 50 Cleric who had spent DPs in Flail — at a very high cost — since level 1. I’m not necessarily saying that’s a bad thing… I’m just saying that some people felt this wasn’t very fair, and it was one of the issues that the new ‘professional bonus’ addresses. It might not be as much of an issue if you use a no-profession system, though, because at least the Cleric character would have had the same cost as the Fighter. It was my memory that professional bonuses only went to 20th level and then for fighters it was +1 per level until 30th? That would make a maximum bonus of +70. I like the system where the bonus is applied per rank and not per level. That prevents the ‘I have never seen a flail but I have a +100OB with it’ problem. You are right; I stand corrected. The level bonus does only apply to level 20 (except for Fighters), in Character Law. 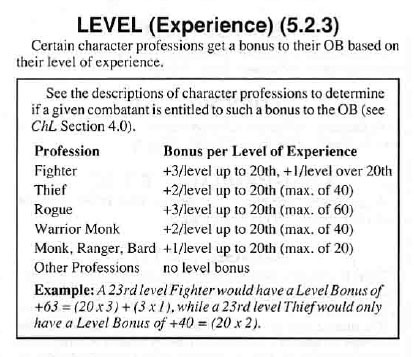 Rolemaster Companion 2 does also offer the option of allowing characters to reallot some of these bonuses (never going below +1 or above +3, which is interesting because it bears some resemblances in some ways to the new RMU system where you pick which specific skills you have the professional bonus in. Interestingly, I also learned the level bonuses for everything except combat and spells were an optional rule in Character Law. We just always used the longer list in Companion 2. I think we always used the RMSS compatible list from RoCo2 as well. Which ever version you used the bonus never went over +60/+70 for fighters, the equivalent of 15 or 20 ranks. On a 30th level character that is less than than a bonus rank per level. The fighter with no skill in flail has an OB of +45 plus probably +20ish for stats by that point. The sort of foes a 30th level fighter face a +65OB isn’t going to save you! Any way I think a slightly more nuanced profession skills system in RMU will make a ranger more rangerish and a monk more monkish to the point where they fit the trope you are looking for. I also think that may gain more traction with the forum members and maybe the devs than individual skill costs. That has never had any support from the developers and isn’t going to get any this late in the day, in my opinion. At level 20 the Fighter would get +60 (+3/level). At 30th level, he would get +90, because Fighters continue to get the full bonus even after level 20. That is the equivalent in RM2 terms of 40 ranks in the skill. At level 40, he would get +120, and at level 50, +150. So it is actually quite significant, for the Fighter at least. In terms of making the skill system more nuanced, I have floated a couple of options. In addition to my individual skill option, and actually in conjunction with it, I suggest that any skill in which a character takes a professional bonus could also come at a skill cost discount. I suggested giving a one-step discount in professional skill costs. So when the Ranger takes Creature Lore as a professional skill, his cost for it would drop from 2/4 to 2/3. It wouldn’t entirely eliminate the problem, but it would help, as well as give additional distinctiveness to the classes. This is one of those rules that gets contradicted in one core book to another. If you look at 5.2.3 in Arms Law the fighters professional bonus is curtailed and this is an option. It is presented as core. Interesting; it does seem a bit of a mess, doesn’t it? I initially didn’t see anything in Character Law about the +1/level after 20th, at least not in the section that talked about the combat bonuses. But I later did find a reference, in the optional rules section, to combat and all other bonuses going down after level 20: +3 bonuses went down to +1, +2 bonuses go down to +1/2, and +1 bonuses disappear. This is a footnote to chart 15.7.2, the Level Bonuses Table. It also refers to sections 4.0 and 5.2. Section 5.2 doesn’t mention them other than to say that a Fighter is the only class who keeps getting level bonuses. Section 4.0 specifies that the bonus goes from +3 to +1 at level 20, though this is only in the description of the Fighter class. So in the end, you are right, and I guess you could even say the RM2 rules aren’t really contradictory; just that you have to hunt around a bit to figure out how they work. Well, that was an informative discussion. The one conclusion I think we can all agree on: we like to play Rolemaster in somewhat different ways. Some of us like a no-profession approach, while others prefer the profession system, whether the latter includes the option to switch professions or not. Vive la difference, as they say! Yes, and regarding RMU the devs can please some of the people all of the time and all of the people some of the time but they will never please all of the people all of the time. Interesting discussion – I had one of those restless nights where odd ideas flow through your head. I posted on FB but your thoughts would be appreciated. What would happen if we took away the level requirement for development and just went to a time investment for learning a skill or meta-skill the latter being my personal choice? It raises a whole slew of questions about innate learning ability, preferences for learning areas, rates of learning development, but it would free your players from the “we go adventuring to become better”. So in my house rules there are no levels and no development points post character creation. Skills can be improved via use or by training. You seem to be pointing to the training aspect. In real life one of my many hats is that of a sports coach. What we see is that people who try and learn a sport in isolation tend to reach a certain level and then plateau. There is not just a curve of diminishing returns but also gateway techniques. It could be as simple as a change of position in a single joint of the body or a change in weight distribution. These things are virtually impossible for an individual to self identify or self correct. People can drive themselves into technique dead ends and they will never get themselves out without a coach or teacher. If you imagine your grip on your sword felt natural but was actually not ideal you are never going to naturally change that grip to something that feels unnatural and makes you a worse swordsman and then stick with it until the muscle memory builds up and the now correct grip feels as natural as your bad grip did. Even if that now allows you to progress and improve beyond your previous plateau. So all of that waffle was to justify my position. I really think that in a level-less progression system coaching or teaching is key feature and can be used by GMs as a limiting factor. It would stop a bunch of players saying that they take a year off and now they all have thirty ranks in broadsword and all spell lists to 20th level. So down to game mechanics. Using RMU as the rules of choice I would like to suggest we use spell research as our progress model. Spell Law says (pdf page 34) Researching Spells on Known Lists: If the spell is on an existing spell list, the researcher must know the spell list to at least the level of the spell to be researched. The amount of time required for the research is equal to the square of the spell’s level plus five days if the spell is on an Open list, ten days if it is on a Closed list, and fifteen days if it is on a Base list. Thus, a seventh-level spell on an Open list would take 7×7+5 = 54 days to research. So let us unpack that a bit. The requirement to already know the skill (have at least 1 rank) is equivalent to already knowing the list. Knowing the list to a particular level doesn’t really apply so we can forget that. Skills don’t have open, closed and base categories but I think you could identify something like core, common and alien skills. For a Fighter combat expertise would be a core skill, ride horse would be common and directed spells would be alien. I think hours are more suitable than days. So to go from 1 rank in Broadsword to 2 ranks would take a fighter 2×2+5=9hrs of professional tuition. It would take a bard 14hrs (2×2+10) and a magician 19hrs (2×2+15). To go from 10 ranks to 11 ranks would take the fighter 11×11+5 or 126hrs of tuition or about two weeks, assuming the fantasy world does not work on a 9-5, five day week model. You mentioned preferences for learning areas. I think you could allow players to identify a certain number of skills as core, common and alien skills. In addition you could give them a learning style. The VAK (see, hear, do) model would be sophisticated enough for most games and you could give each trainer a random roll to see which is their teaching style. If the student and teacher are both well matched then the time is as written. If the student and teacher are not using the same teaching and learning style then the time requirements are doubled. There you go. That solution uses existing rules and incorporates preferred learning areas, learning and teaching styles and removes the requirement to kill 30 orcs to improve your spoken Quenya skill. Peter that is a fantastic confirmation of the thoughts that went through my head as well. I too am a sports coach and also a primary/elementary teacher, but also have been through education all the way up to doctorate and beyond, so understand zones of proximal development, the incremental gains in knowledge and skill and also the plateaux effect. Funny you should mention broadsword and grip. My story is a badminton racquet and being a fairly decent player but getting coached by an ex-national player and just changing grip slightly and getting so much more control. I was also thinking that pupils show certain aptitudes which may or not be developmentally linked. The way some people just get maths and others how to kick a ball. Which makes me think that the skills based on aptitude (stats) would have a reduced learning time. However, you have essentially answered my question. New house rules coming over the horizon. I wonder how my players will cope? 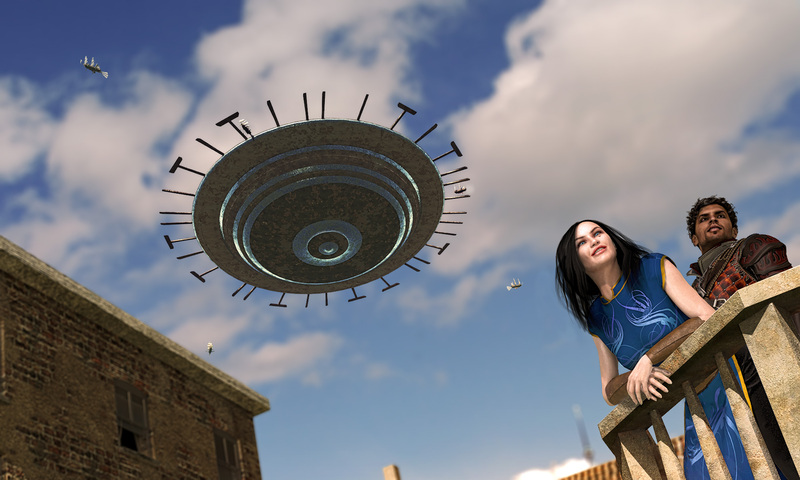 Brian has an interesting take on bonus per rank which is worth taking a look at https://www.rolemasterblog.com/deconstruction-character-creation-game-modeling-skill-systems-rm/. So rather than the diminishing returns we are all used to Brian has a bell curve where the ‘beginner ranks’ don’t give as big a bonus, they then get into their stride and then finally diminishing returns kick in again. If you are thinking of house ruling then that may or may not work for you. In my house rules I allow study to learn ranks. I was using a fixed 20hrs per rank but when I revamp my house rules for RMU I think I will use the system I detail for you. When the characters are adventuring I use a runequest style system where when they have used a skill in a genuinely useful way they mark that skill and the stats relating to that skill. The next time they are healing up of whatever they get to roll d100 if you roll over their current skill bonus then they gain a rank. They also get to stat increase roll the stats that related to those skills. Again that is roll d100 and if they get over their current stat then it goes up by one. This means that by adventuring the skills that are actually being used are the ones that improve. The skill bonuses improve quite rapidly to the 10 ranks +50 region but then the pace of increase tails off. The stats that characters use are the ones that improve over time as well. The same system works for spell lists. If you know the first level spell then you actually have to use that list to get a chance to roll to gain the second level spell. That means that spell casters end up with a rather spikey profile with some lists highly developed and others very limited, also no two casters know the same range of spells. Previous PostPrevious Is Rolemaster Worth Saving?